Mankwe Gametrackers Outdoor Adventures is offering you an experience of a lifetime to view Africa’s wildlife including the “Big 5” - an experience that will be one of the most unique and exciting moments of your life. 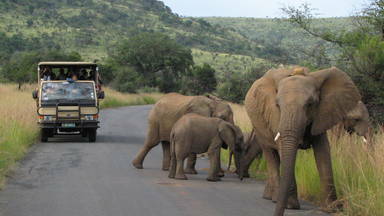 This amazing journey will take you through the Pilanesberg National Park situated next to Sun City.This picturesque Park is situated within an extinct volcanic crater, made up of over 55 000 hectares of rolling plains with an abundance of Africa’s wildlife which is sure to keep you enthralled throughout your safari. Depending on your adventure level we have a variety of wildlife activities to suit your needs.